Soaring Dance Theatre, a dance studio and performing arts school, is a cultural oasis in the midst of a woodsy and lake setting in Monroe, New York. Classes, private lessons and coaching are offered in dance, piano and theatre. We offer dance classes and piano lessons for children, as well as adults. Students range in age from 3 years old through adult. Soaring Dance Theatre…where dance class honors the beauty of movement and is not focused only on a recital routine. All classes are small and focused on learning technique, enhancing personal expression, and individualized instruction. Our teachers are professionals of the highest caliber. Your learning experience at our dance studio will be enjoyable and inspiring. Roberta Monkash is a master teacher known for her dedication to the performing arts, her love of teaching, and the quest for excellence she instills in her students. 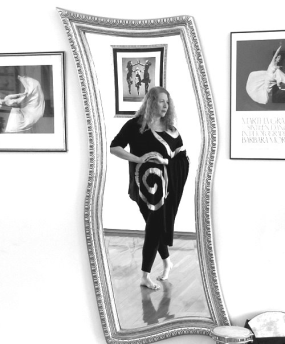 Roberta Monkash is a professional dancer, choreographer, musician, writer, and teacher. Roberta resides with her family in Monroe, N.Y. She has performed as a solo dancer throughout the East Coast and in Israel. She appeared as a featured soloist at the 92nd Street Y in Manhattan and for many years danced with her companies, Soaring Dance Theatre and Al Knafayim. A graduate of New York’s High School of Performing Arts, Roberta earned a B.A. in Musicology from New York University, a Graduate Certificate in Psychomotor Therapy from New York Medical College, and a M.A. in Kinesiology from Goddard College. In addition, she holds New York State teaching certifications in Dance Education and Music Education, and is a performing arts teacher at the Enlarged City School District of Middletown, New York. Roberta’s choreography has graced the productions of countless community theatre groups. She has also been the choreographer and director of a number of shows for the Helen Hayes Youth Theater. Some of her dance creations have appeared in commercials and was a performing arts teacher at the Enlarged City School District of Middletown, NY for 20 years. So, if you are looking for a theatre, piano or dance class for you or your kids, come into Soaring Dance Theatre today!